Shopping in Jasper is fun and convenient, and most stores can be found within a short radius of downtown Jasper. What makes Jasper shopping even more fun is the number of cafes and restaurants that you have to walk by while strolling through the shopping streets! Fashion lovers will enjoy trying the latest designer brands, while for the more practical minded may prefer the technical wear in the outdoor stores. If you need something special such as Canadian diamonds or local artwork, you should head to one of the jewellers or art galleries. Totem Ski Shop offers an excellent selection of ski and snowboard rentals including kids’ packages and cross country skiing equipment. 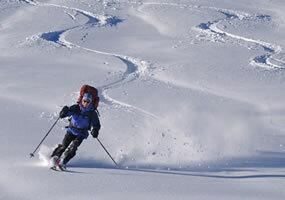 For the more adventurous backcountry enthusiast, avalanche equipment, ice axes, crampons snowshoes and backpacks can also be rented. Summer equipment includes tents, sleeping mats, stoves and backpacks. Whatever you need to make the most of the mountains around Jasper, there is a good chance that Totem can help you out. For more information, visit the Totem Ski Shop website. Below we have listed a further selection of Jasper shopping recommendations.